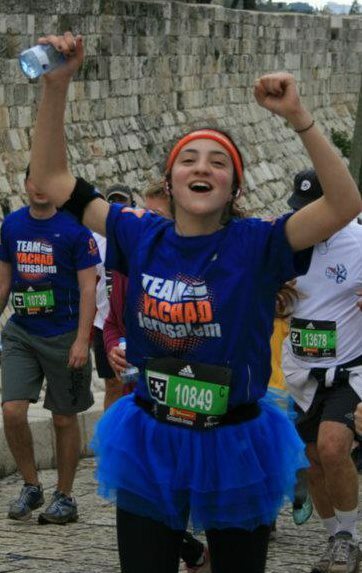 Hello prospective Yachad members or veteran runners just rejoicing in memories from the great marathon this past March in Jerusalem! I’d like to share my experience with you all reading this. I was in Yeshiva this past year and saw the advertisement for the marathon in the Old City posted on some wall. I didn’t think twice about signing up for the 10k run and was excited to raise the money for the great cause I was going to run for! So it was and i started shooting emails to literally everyone i knew and could get too. I raised a little over $500 which was a great accomplishment in itself for me. Simultaneously, I was physically training to get in shape and run 10k in 50 minutes or less to reach my goal. Practicing with Chaim Wizman, the coach, and other runners was a ton of fun! Race day came and “I could feel the excitement in the air” as they say. I started out strong in the race and kept a fast pace and as a side note I remember during that whole hour of running there were 4 different season changes! It was sunny and hot, to rainy and cloudy, to windy and humid, and lastly it even hailed! in Jerusalem! After all I finished the 10k in 58 minutes and got in 1000th something place haha. What made all the running worth was meeting up with the people from Yachad in Gan Sacker on their Birthright trip. That’s when i felt the full accomplishment! hope to run the half marathon next year! Shalom. 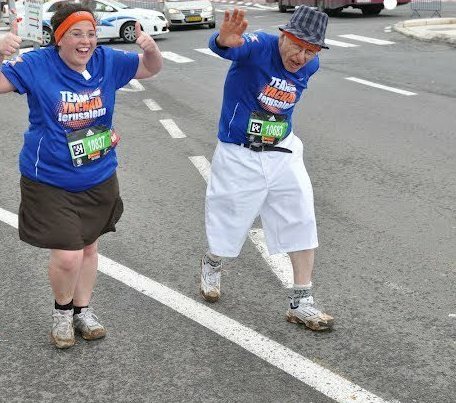 The 10K I walked as aproud member of Team Yachad was my first one. The race was shortly after I broke my ankle and was walking with the aid of a walker. After completing psychical therapy on my own, with much help from Hashem, i was able to walk the 10K with Team Yachad and all of my new friends I met along the way. 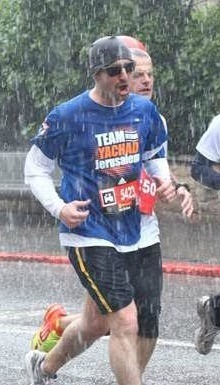 My Team Yachad mates were very helpful in encouraging me to continue to race even as the rain poured down from above. One of my friends didn”t believe that I would go through wih the race but he supported me to aid the Jews with Disabilities. I was the only grandfather on Team Yachad and I am very proud of that! Let us go M’chail L’Chial, strenght to strenghth. I ran (fine, I didn’t actually run, but I did power walk!) the Jerusalem 10k with Team Yachad. I’ve never done a marathon before and I wasn’t doing it to get the best time or for a trophy. I did it for the members of Yachad. The race started at exactly 10:15am. The weather was pretty gloomy but yet all runners ran with as much energy as they would have if there had been sun. 10:15am the announcer says ready set go! Almost at the finish line, I met Melissa- a girl studying in seminary for the year. She has special needs. Many students with special needs also did the 10k, not once complaining of the cold , hail and rain. We were about 20 minutes from the finish line and Melissa almost began to cry. “I can’t ! I can’t! My legs hurt!” I told her “No! Yes you can, You made it his far and you’re going to cross that finish line!” I held her and she squeezed my hand. I told her not don’t cry, believe in yourself, you made it his far and you can do it!! And she did. The smile on her face , knowing that she accomplished the race was priceless. So yes, I crossed the finish line at 01:59:04, but that’s ok because I still got a medal! OK, everyone gets a medal but still it’s super cool! Before making Aliyah in 2003, I attended many Yachad Shabbatonim and even hosted several participants for Shabbat when my wife and I were chapter heads in NCSY. Now that we live in Israel, we host Yachad participants who are learning in Yeshivot across Israel. So when I saw the ad for Team Yachad, it was a no brainer! Not only was this a great experience but I finished with a PR (personal record) in arguably one of the most difficult half marathons around, despite the weather! 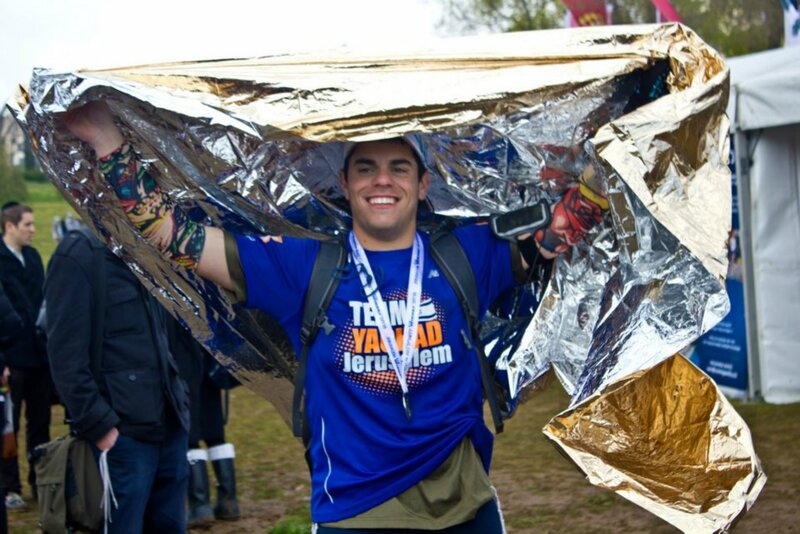 Crossing the finish line soaked to the core was not ideal but the amazing feeling of being able to raise money for Team Yachad in Jerusalem– nothing like it! I first saw the ad in the Torah Tidbits (OU Israel’s weekly publication),and I decided to join Team Yachad. I was so motivated to run because I knew that the money being raised was going to a great cause. Running the Half-Marathon, while getting drenched with rain, was a wonderful experience, and one that I will not soon forget! It was probably the most exiting thing I have ever done! As a teen, I was always big into chesed and jogging. I love working with special needs individuals because it’s a chesed where everyone benefits. 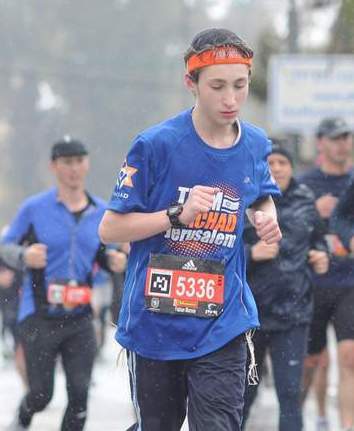 When I came to Israel to study in Yeshiva, I heard about an opportunity that infuses my two great passions… leading me to join Team Yachad in the Jerusalem Marathon. What I loved most about this race was that I ran with excitement and commitment as i succeeded in raising money for such a great organization. With much effort, I managed to raise $1,019 even after setting my goal at just $500. I ran faster than ever and I know it was because I was running for a great cause. I hope to continue working with the special needs population and continuing to help in any way that i can to ensure that these participants are able to have the best time of their lives while on Yachad’s inclusive programs. 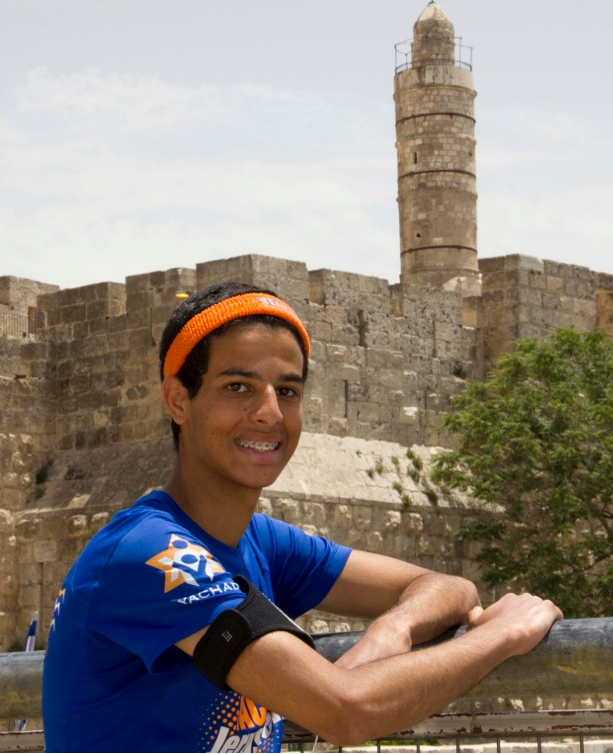 I can’t wait to run again with Team Yachad in Jerusalem 2013. Next year I’m taking my goals higher!